Am i wrong about SF being dedicated to learning? I posted this on SF about 30 minutes ago, within 2 minutes it was marked as off topic. How? I added two comments right after one which is still there and the other which was removed I will post it here. Hello, Dont just tell me that im off topic without a solution. I am really starting to hate the politics that go into SF, the site is dedicated to professional trying to learn, but asking a question about how I can learn something is off topic? I really wish there was a better alternative to the stack exchanges, they are really getting more and more power faulting mod, so you had time to mark it as off-topic but you cant answer my question? Other questions not closed why? How to learn max/min value of a sysctl parameter can be in FreeBSD? Where can I go to learn how to read a sql server execution plan? Looking through there are a lot of question about "How to learn" that are marked as off topic. Why? I am really pissed off right now, and really cannot do a thing about it as SF and stack exchange are the only sites that work and provided answers to question is a very nice and easy to use fashion. I have a lot more to say but at the risk of getting banned I will leave it at that. The active community members decide on topicality and with more exposure the focus has become slightly more strict over the years so old questions are not always a good indication. First, when I deleted your comment, its content was something along the line of "bump, hello bump", nothing more. It might be that your edit happened at the same time as my deletion (the SE software doesn't handle parallel actions well). Second: It's very clear that this type of question is off-topic and I am tired of discussing it. If that doesn't suit you, fine. Your three examples are quite bad. The first is nothing like your problem, the second is six years old (and now also closed). Our site has changed over time and "this wasn't off-topic in 2010" isn't a valid argument at the end of 2016. The third was already closed in 2012. Finally: No one is in any way obliged to give you any hints where you might or might not post a question that is off-topic here. That's entirely up to you to find out. No, it is indeed. However, not in the way you were hoping. Rather, it's dedicated to professionals helping other professionals with real-world problems they're experiencing with the systems they manage. As you've seen already, learning material recommendations are explicitly laid out as off-topic. One user and one moderator were browsing SF, noticed an off-topic question and put it on hold. Question comments are not the place to rant about why you are frustrated with Serverfault. I removed the comment and recommended you post here on meta.SF instead. Because it's off-topic, per the "on-topic" page for the site. Not unrelatedly, Server Fault is supposed to be for professional administrators. 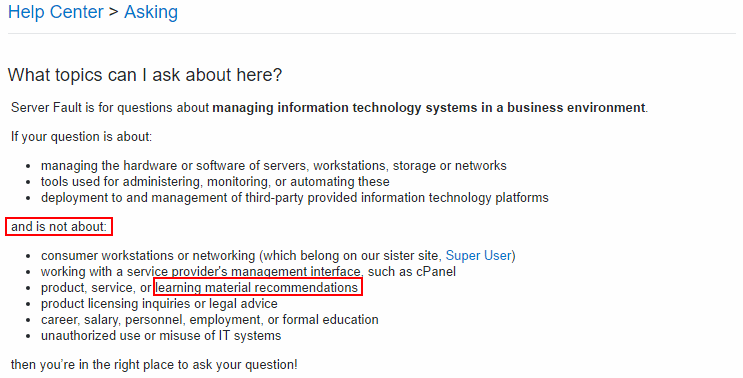 If someone needs to "learn about networking" without access to networking gear, in what way are they a professional administrator?